Just a couple of issues ago, we reviewed a group of one-box hi-fi systems, concluding that the best of the breed can give performance worthy of the 'hi-fi' tag. And still they come: here's another such unit, the Note Premier, bearing the brand name Aura, but made in Korea by April Music. Aura may ring bells if you've a good memory: it was a UK brand some 15 or so years ago and the name has been bought-up by a Japanese concern which passed manufacturing to April, but brought back British industrial designer Kenneth Grange to provide a certain look to the kit. And the looks are certainly striking. The front panel is dominated by a mirror-finish stainless steel panel with a simple display and what looks like a black grille sitting beneath – it's actually the heatsink for the power amplifier stage. The top has more stainless steel and a thick sliding-glass door over the top-loading transport. Top-loaders are rather deluxe, we reckon. Yes, there's the puck to put in place, but that becomes second nature after one's played a couple of discs, and frankly it's all a much nicer experience than trays or slot-loaders, and quicker, too. And just as much to the point, this transport saves quite a lot of internal space. That's important because the Note Premier (there was once a plain Note, by the way, though it hardly made it into the UK) is small and includes a lot of features. CD, obviously, but also FM and AM radio, but no DAB (worldwide, rather few countries apart from the UK are going for that in a big way and internet radio may well prove more of an issue). There are also two line inputs, an optical digital input and two USB sockets, one each of A-type and B-type. The former is for USB memory sticks and iPods, while the latter connects to a computer, allowing digital streaming of audio including the aforementioned internet radio. Twin USB sockets like that is still a rarity, but it does mean the Note Premier is significantly more flexible than most of its breed, ready for pretty much any kind of computer music duty. It will even copy tracks from CD to a USB stick, as MP3 files (128kbps). Even better, it will record from radio. Result! Even though 128k MP3 is not the highest of high-fidelity, it would be churlish not to herald this as the first 'hi-fi' FM tuner capable of recording. Why did it take so long? Video recorders included a tuner almost from the year dot, but we waited over half a century from the inception of FM to get a combined tuner/recorder. Thank you, Aura. Oh, yes, there's an amplifier, too. It's a straightforward linear one with a MOSFET output (the original Aura amps used something similar) and it's fed by a linear power supply, so those who stay awake at night fretting about switching circuits in their audio signal chain can sleep easy. It's rated at 50 watts, though that's into a low-impedance load and in normal 8-ohm terms it's good for about 35 watts. 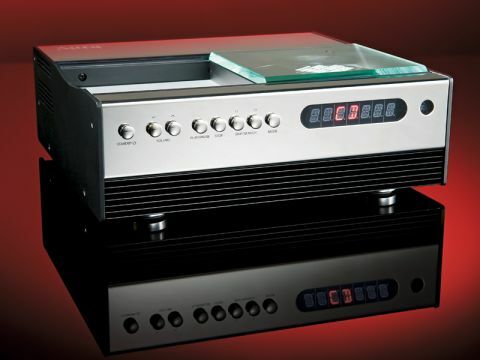 A preamplifier output allows you to hook up a more powerful power amp if you really feel the need, or perhaps more likely, feed a slaved system in a second room. Connections are completed by a proper 6.3mm headphone socket. Aura emphasises ease of use in its publicity for the Note Premier and we've no quibble with that. With so many features on offer, it's still completely straightforward to operate the unit and the rather bland-looking display tells you all you need to know, simply and legibly. About the only time one might wish for something fancier is when playing MP3 or WMA files (not WAV, incidentally) from a USB stick, as these tend to scroll across – but one can generally see enough at once to work out what it being played. Physical assembly of the Note Premier is worthy of mention as it's exceptionally ingenious. It's not just the way the circuit boards are arranged inside – Nagra mastered that art in the 1960s – but the case assembly is unusually well thought out too. As for the electronic components, they're good quality and in some places quite novel, notably the radio stage. Almost all hi-fi tuners of recent vintage use a bought-in module to do most of the work, but this product takes integration to the next level and uses a single-chip radio circuit from NXP Semiconductors, putting the radio functions on the main circuit board and saving a couple of cubic inches in the process. USB functions are handled by the usual integrated circuit and a good-quality DAC chip sits at the heart of things for all digital sources. What, perhaps, impressed us most of all was the sheer impact of the sound. It's not vastly powerful, though momentary peaks can exceed the continuous power output by a factor of nearly 2:1. Even so, it took a real grip on our Bowers and Wilkins' 803S speakers (and on the ATC and small JBL models we tried it with), producing the kind of visceral bass you simply don't expect from affordable audio. This is really not so much to do with extension as with precision, but it does, of course, make the bass feel deeper and at the same time brings out the quality of the low frequencies – whether they originate from something tuned (double bass, piano, organ) or percussive, and how they propagate and decay. That finding was consistent across the various sources on offer and it's clear that the amplifier part of the Note Premier is also very assured in the high frequencies. There's a little more variation high up between sources, with CD sounding very open while the optical and USB inputs are just a little less revealing in the top octave or two. That's the USB computer connection we're talking about – the side-mounted socket for memory sticks and portable players is limited by the fact that it only accepts data-compressed formats, but it still makes the most of such hamstrung sources. The tuner naturally lacks a little of the CD player's sparkle, but we have to say we're very impressed with it. By the standards not only of all-in-one systems, but also of recent standalone tuners, it is very clean sounding even with less-than-perfect radio signals from an indoor aerial. Fed from a proper rooftop antenna, receiving a good broadcast on BBC Radio 3 or 4, it sounds unusually open and free of reception 'nasties', with good imaging and detail. We won't pretend that this is the be-all-and-end-all of audio. For a start, the lack of power does eventually make itself felt and if you like listening really loud on insensitive speakers, it's obviously going to fall short. We concede that imaging might be just a shade more extended and precise (Mozart string quintets showed this up) and that the presentation may be a little more gung-ho than one might wish for. Still, the opposite of that would be of far more concern and, in general, there's so much going for this unit that we can really only recommend it very highly.